I bought this wifi + bluetooth adapter. Wifi works natively without any kext but no bluetooth in system preference. Wifi and bluetooth works on Windows and linux without any problem. I am using clover and I installed BrcmPatchRAM and nothing changed. In system report no bluetooth info but in usb it see Broadcom device . you can see in picture. Last edited by Shaneee on Tue Sep 05, 2017 12:25 pm, edited 2 times in total. Reason: Link Coded. What I experienced with SierraAMDv5 is that : With the integrated fix for USB, every port works, and effectively BT is recognised under USB section, how ever, it doesn't work. I fixed the problem by removing 3 kexts : 2 DummyUSB...... and GenericUSB....., sure only some USB ports will be recognised, but my BT work (Orico BT403 which works OOB). Thanks for help. I tried but still it is not working. Thanks for help. I deleted usb kexts and rebuild cache but still it is not working. Install one of BrcmPatchRAM.kext or BrcmPatchRAM2.kext depending on OS X version, never both. BrcmPatchRAM.kext: for 10.10 or earlier. BrcmPatchRAM2.kext: for 10.11 or later. Also, install one firmware kext BrcmFirmwareData.kext or BrcmFirmwareRepo.kext, depending on installation location, never both. BrcmFirmwareRepo.kext: Install to /System/Library/Extensions. This kext is much more memory efficient than BrcmFirmwareData.kext and is the preferred configuration. Advanced users: For custom firmware injectors, install the injector plus BrcmFirmwareRepo.kext. This works from either /S/L/E or EFI/Clover/kexts. Optionally, you may remove all the firmwares from BrcmFirmwareRepo.kext/Contents/Resources. If you're using the injector from Clover/kexts, the IOProviderClass in the Info.plist for BrcmFirmwareRepo.kext must be changed from "disabled_IOResources" to "IOResources". And still, you may find it unreliable... as that is the way Clover kext injection is (it does not simulate kext installation perfectly). In testing, best result was obtained if you replace the IOKitPersonalities entry in BrcmFirmwareRepo.kext Info.plist with that of the injector kext (no need for the injector at that point). Also, if you have a non-PatchRAM device (or you're not sure), install one of BrcmNonPatchRAM.kext or BrcmNonPatchRAM2.kext, depending on OS X version, never both. Although these kexts do not install any firmware (these devices have firmware built-in), they still depend on BrcmPatchRAM/BrcmPatchRAM2.kext. BrcmNonPatchRAM2.kext: for 10.11 or later. 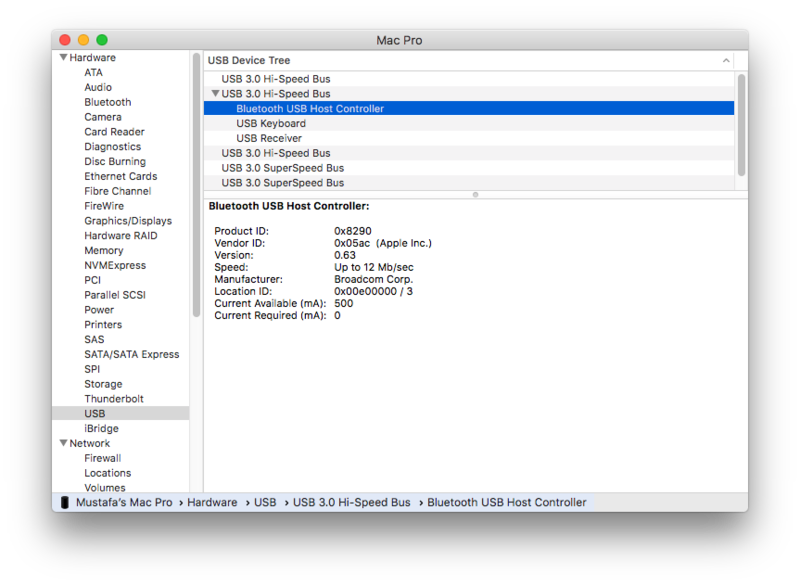 @mzgs - I see that in System Report, the Bluetooth is showing up as connected to your USB 3.0 controller. Did you connect this to the USB 3.0 header on your motherboard or in some other way? And... Did you ever get the Bluetooth on your Broadcom card working? I just received one of these cards and my WiFi is working OOB bu the Bluetooth isn't even showing up on the USB bus. I'd love to hear what worked for you. I meet the same issue with 943602CS, do u have an effective solution to this now? I have fixed this by using the kext the man meant before with some other modify. Here is the solution.